The 48 bus makes a stop on North 29th Street and Girard Avenue on Tuesday, March 14, 2017. Philadelphia and the suburbs area could see a bit more snow Tuesday as a Alberta clipper connects with a secondary low pressure system moving up the coast. Recent weather models indicate good conditions to support snow banding on the north and northwest side of that coastal low, forecasters said. 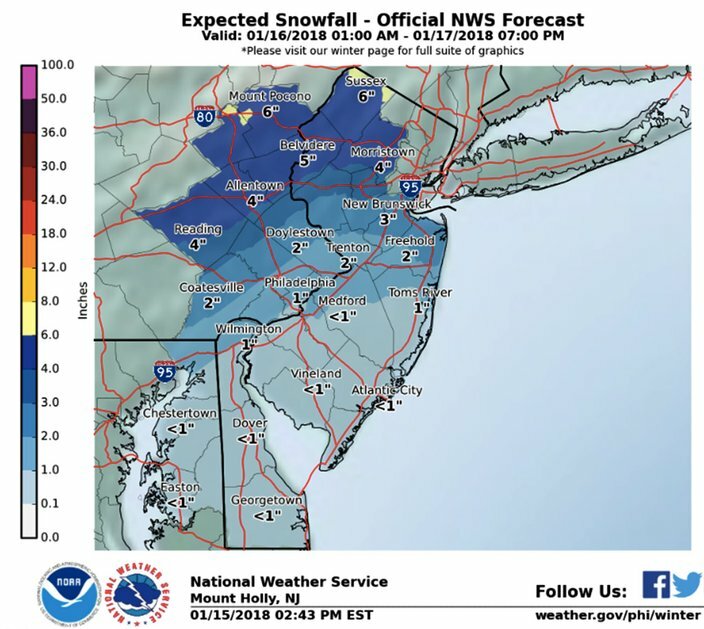 Thus, expected snow accumulations were bumped up with moderate-to-high confidence, especially for areas like Allentown and the Poconos. 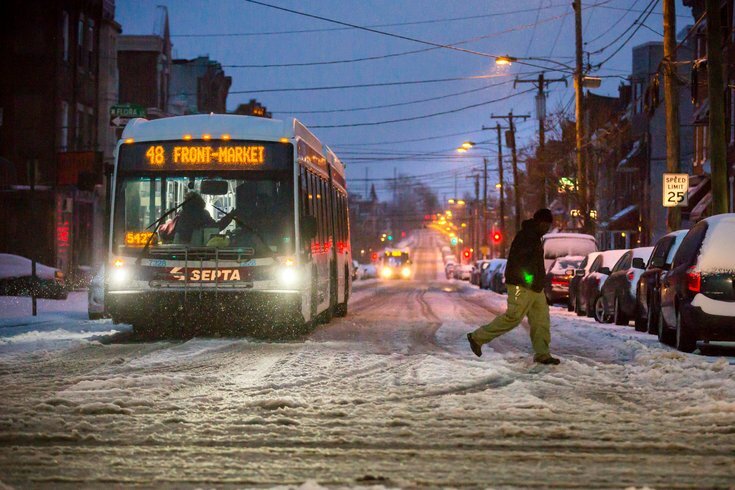 Between 1 and 4 inches is expected in Philadelphia and its northern and western suburbs, with the higher accumulation north of the city. Allentown is likely to see at least 6 inches, with up to 8 inches in the Poconos. Light now is seen accumulating to less than an inch in South Jersey and at the Jersey Shore. Accu-Weather sees the potential for 1-2 inches of snow across the eastern two-thirds of Pennsylvania, including Philadelphia, from Tuesday afternoon into Wednesday. The Tuesday PM rush hour could be impacted as untreated roads and sidewalks may start out wet, then become slushy and snow-covered as colder air moves in, Accu-Weather said. Meanwhile, the cold is creating problems in Bucks County. The weather service had issued a flood warning for Yardley and Morrisville in Bucks County as well as Trenton and Ewing in New Jersey through 5:30 p.m. Monday due to an ice jam in the Delaware River. At 9 a.m. Monday, emergency management officials reported flooding across the warned area. Multiple road closures due to the flooding were reported along Route 29 in Trenton. Flooding was also reported along the Delaware between Morrisville and Yardley with portions of River Road closed near the Calhoun Street Bridge, Richard Road, Black Rock Road and Ferry Road. Looking ahead to the weekend, high pressure is expected to build across the region late in the week and bring dry weather and warmer temperatures. The game forecast for the Eagles' NFC Championship contest against the Minnesota Vikings at the Linc is partly sunny with a high near 53 as the tailgaters light their grills on Sunday afternoon. The low Sunday night will be around 49, with south-southwest winds of about 5 mph and a 22 percent chance of precipitation, according to Accu-Weather. Monday night: Cloudy, with a low around 26. Northeast wind 3 to 6 mph. Tuesday: A chance of snow before 4 p.m., then snow likely, possibly mixed with rain. Cloudy, with a high near 35. Light and variable wind becoming south around 5 mph. Chance of precipitation is 60 percent. New snow accumulation of less than a half inch possible. Tuesday night: Snow. Low around 26. Calm wind becoming northwest 5 to 8 mph after midnight. Chance of precipitation is 80 percent. New snow accumulation of 1 to 3 inches possible. Wednesday: Snow likely, mainly before 10 a.m. Cloudy, then gradually becoming mostly sunny, with a high near 31. Northwest wind around 10 mph. Chance of precipitation is 60 percent. New snow accumulation of less than a half inch possible. Wednesday night: Partly cloudy, with a low around 19. Thursday: Sunny, with a high near 32. Thursday night: Mostly clear, with a low around 24. Friday: Sunny, with a high near 40. Sunday: Partly sunny, with a high near 53.